Our beer of the week is Oxnard Pale Ale from Casa Agria; a hazy pale ale that is hoppy, juicy, and extremely easy to drink. 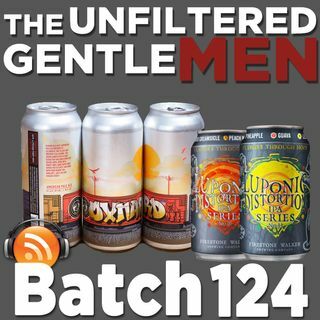 The gentlemen talk about their Thanksgiving holidays and how much beer they had, and Greg talks about the new Drink Local shirt with profits going to charity. Dan reviews (and has a grievance with) Creed II, the new movie in the Rocky universe. We share a new drunk story from our day at Oktoberfest. We conduct some very important Beer Science with two of Firestone ... Más informaciones Walker's Luponic Distortion IPAs. In Sports Talk: NBA ratings are down thanks to LeBron, Andy Dalton is done for the season, Leonard Fournette is suspended, and Derek Carr sets a new record. In Booze News: San Diego's brewers produce tons of beer, 21st Amendment furthers their distribution, Canarchy launches Canarchy Collaboratory in Asheville, Sierra Nevada brews a beer for fire relief, and much more. Make sure to follow our Beer Babe of the Week on Instagram @manicpixiebeergirl! Old Timey Word of the Week: "Stagecoach Tilter”. Use it in a sentence on social medias for a shout out!